The fan cam records video of visitors and broadcasts it live on one of the screens. The second monitor features exclusive Blue Man Group clips and content from the show. 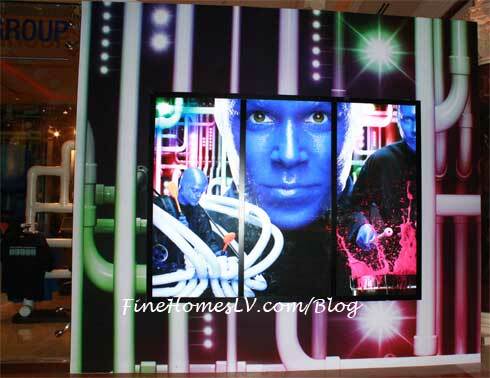 The Blue Man Group shopping destination also showcases a variety of merchandise from the highly popular show. Featured products consist of drumsticks used during actual performances, CDs, mugs and glasses, magnets, key chains, DVDs as well as apparel including T-shirts, coats, hats and more. The Blue Man Group retail store is open 10 a.m. to 12 a.m. daily. For more information regarding Blue Man Group merchandise or to purchase online, visit www.bluemangoods.com . Wildly popular around the world, Blue Man Group defies simple description. A musical feast? Yes. A roller coaster of comedy? Absolutely. A stunning mix of technology and raw imagination? You bet. It’s all that and so much more. This explosion of color, humor, music, and technology comes to life every night in the custom-built Blue Man Group theatre at The Venetian in Las Vegas. The show’s contagious energy engages the audience, thrilling adults and kids alike. It’s intense, exciting, interactive and above all – a must-see. Ticket prices for the Las Vegas show start at $59 plus tax and service fees. Call 702.414.9001 or 1.800.blueman for ticket and show information. Special military and children’s pricing available. Ask about Blue Man Group’s dinner and VIP packages. Blue Man Group will be moving to the Monte Carlo Resort & Casino in the fall of 2012. Visit www.blueman.com/vegas for more information.